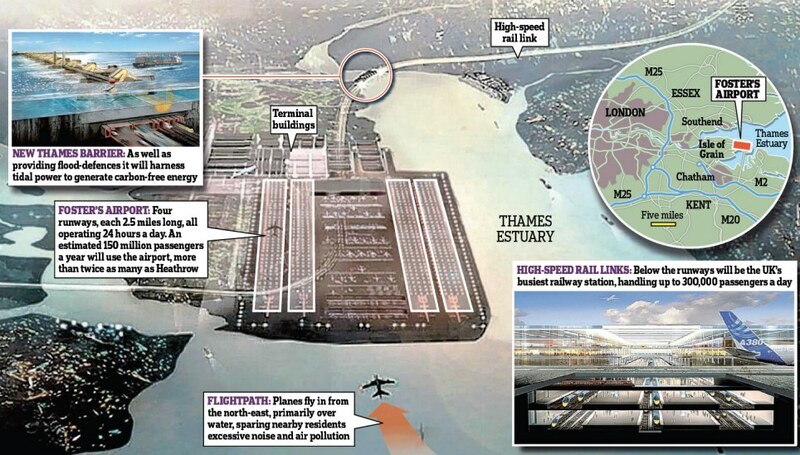 Trans-trax: A new airport in the Thames Estuary, vision or folly? A new airport in the Thames Estuary, vision or folly? In November Lord Foster added to the debate about the need for extra airport capacity in the South East of England when he published his proposals for a new massive airport to be built in the Thames Estuary.These complement London Mayor Boris Johnson´s proposal for a new airport in the same area.The article from the Daily MailOnline (3 November 2011) provides this illustration. The choice of the actual sites has been made for a variety of reasons. The most important is the need for airports to be taken away from built-up areas so as not to cause acoustic and exhaust fume pollution to the residents, workers and school children under the flight paths of the present airports, as well as safety reasons. All that is true and very real. Other reasons given are numerous such as the need to have the airport operable 24 hours per day - especially to facilitate the night time use of the runways for freight traffic. Even for passengers there would well be an advantage in 24 hour use. By having more flexible hours the possibility of extending the take off/ landing times means the ability of offering a greater variety of operating times at the distant airports. Also connecting flights might arrive later into the airport at night and leave earlier in the mornings. This is not an unappealing option for arriving passengers whose body clock is out of kilter because of differing time zones. 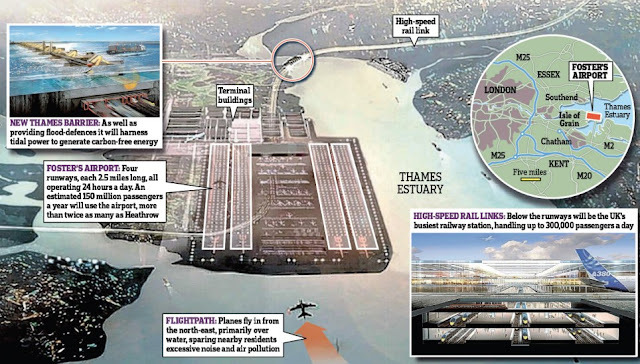 Four runways would facilitate the ability to increase the number of slots(takings off and landings) so that more airlines and more destinations can be on offer to connect this "London Estuary" airport to the world. This is important, in the case of long haul traffic, since many more destinations could be offered with fewer restraints on airlines from distant countries being able to fly into a large hub and offer connecting flights (or other transport modes). For short haul traffic it is important to a country like Britain in that it would enable the airport to offer flights to/from the outer reaches of the British Isles - meaning the UK, the Republic of Ireland, the Isle of Man and the Channel Isles - together with less accessible places such as the Faroe Islands and Iceland where rail connections are no option. Even many outer reaches of mainland Britain might gain where rail is no real option - such as Aberdeen, Inverness, Plymouth(now closed), Exeter or Newquay. Underneath the airport there would be rail stations to provide access to local services(in the south-east of England, including a connection to Central London) and inter-city long distance services (to the major conurbations) in England, Wales and Scotland. Rail services to the European mainland could also be offered through the High Speed 1 (HS1)railline nearby by a short connection. An estimated 300,000 passengers daily would use all the rail services providing a better and faster service than road traffic. Additional advantages would be built in - such as another Thames barrier to stop flooding in the upper estuary area while at the same time generating electricity through tidal flows. This would power the needs of the airport and some of the surrounding areas. The estimated capacity of the airport would be 150 million passengers annually. This is more than double Heathrow´s present annual passenger traffic. There are some who question the need for increased runway capacity in the South East of England. They point out that London has five airports of which only Heathrow is effectively operating at capacity. There are good regional airports serving their cities or conurbations which are operating at below capacity which could well absorb the needs for far greater numbers than at present only if the flights were provided at the local airports. The greater use of railways would reduce the need for domestic flights and where using a London airport is unavoidable then rail connections to/from the airports (such as the proposed rail-spur from HS2 - London to Birmingham - into Heathrow and out to Europe via HS1). The most influential group following these ideas are the Liberal Democrats who are the junior partners in the British Government at this time. They were the ones who proposed a ban of any sort of runway expansion at London´s Heathrow, Gatwick and Stansted airports. The first breech in this policy is beginning to appear. FLIGHTGLOBAL, again, reported on 29th November "UK govt to explore all airport capacity options,bar Heathrow expansion". The need for runway expansion in the SE is expressed by large and important sectors, though general public support is not there. ........ among many others, and these are only from 2011, after the government had already decided to stop expansion at the London airports. BLOOMBERG "Heathrow Airport Resists Capacity Crunch as Noise Bar Favors Coastal Hub"(14 December 2011) This is a balanced article explaining what is happening at Heathrow, with its limitations, and the Thames estuary alternatives, as proposed. CAPA Centre for Aviation "London’s Heathrow competitive disadvantages are beginning to hurt" (11 April 2011) A short article with some up front data reflecting the postions of the airlines, together with destinations as well as market shares. anna aero "A Hoover Dam in the Thames – the growing political will to replace Heathrow with an all-new airport" (24 November 2011) This is a strong article with relevant easy readable data comparing the five London airports and the type of customers as well as the numbers involved. There have been a lot of words spoken and written about the need to stop looking for patchwork solutions and return to the days of our our great Victorian ancestors. Those entrepreneurs, investors and engineers built tremendous infrastructure. Not only did they cover the country with the revolutionary new form of transport and communication, the railway, but also accomplished engineering feats to achieve these projects.Bridges, tunnels, magnificent stations, hotels and port facilities were all among their achievements. These skills were then exported to the world to build railways across continents and mountain ranges which were unimaginable a generation earlier to change the lifestyle of everybody who came in contact with this means of transport. Why cannot we think in those terms yet again, to achieve marvels, especially with the latest form of travel, air transport? Cannot we provide construction and manufacturing jobs to boost the economy? It all sounds good but there is a lot to look at before such an endeavour can be attempted again. A macro-airport by the Thames is a macro-project so the government will be involved one way or another. Even if the airport itself is constructed with money provided by private investors - not a sure thing - the taxpayer will have to put up the money to connect the airport to the national road and rail networks. This alone is not cheap. Also, more than likely, the government would have to provide backing for private investors (Politically, and economically, who could permit an investing bank, insurance company or pension fund go bust if everything went wildly wrong?) The crisis of 2008 demanded an excessive amount from the taxpayer to prevent a recession. 2011 only aggravated the economic situation, and subsequently government finances, in western Europe due to the crisis with the Euro, even in the UK (outside the eurozone). This means such a macro-project would be extremely hard, if not impossible, to finance. We do not have to look far into the past to see comparatives. The investors in the Channel Tunnel (1980s-90s)effectively lost their investment with the cost overruns, during construction, and low traffic figures during the first years of operation. At the very best they will recuperate the initial investment at the end of the 21st Century. Everybody will be very wary. Lord Foster estimated the cost of his project at GBP50 billion (about €60 billion). His company was the architect for Hong Kong´s new twin runway airport built in the bay off Lantau Island. This, of course, means he should know what he is talking about with regards to facilities, construction time and cost. Incidentally, Hong Kong´s government is now considering a third runway at the airport(Air Transport World 29 December 2011 "Hong Kong airport third-runway recommendation goes to government"). However, people will be cautious and even reluctant to invest in such a macro-project. The Channel Tunnel is a monopoly - there is no alternative rail route to mainland Europe - though there are other forms of transport. The Estuary airport is not a monopoly. It will be competing not only with other forms of transport but also with other airports, both within the UK and on mainland Europe - not least Paris (CDG) and Amsterdam(Schipol). Even if we disregard Paris and Amsterdam there is no guarantee that London Estuary will attract the airlines and so the traffic. The airports at Southend (no big loss) and London City (much to the chagrin of businessmen in the City and Docklands) would be forced to close - their take off/landing paths would clash or be too close together. But "Estuary" would not affect Stansted, Luton, Gatwick or Heathrow. There is no talk or proposal for them to close. To give an example of what would happen. In the 1970s Gatwick was still underutilised so the government of the day tried to get all the foreign airlines to transfer to Gatwick. They refused point blank and insisted that they stay at Heathrow with British Airways. It must be mentioned, and emphasized, here that we are talking about a time when route capacity was shared equally between the foreign carrier and BA. In that case no carrier could dominate the routes and competition with other carriers was severely limited. Now we are talking about a time of free movement without government controls on capacity not only in Europe but also to other countries. Thus obligation on carriers to transfer to "Estuary" is a non-starter. The airlines want to stay together where the traffic is generated. Another example is in Japan where airlines were forced to fly into specific airports.Have not the Japanese opened up to foreign airlines, again, the more central Tokyo Haneda airport to compete with the designated international airport Tokyo Narita and this has been accepted with open arms by the foreign airlines? - a project for an estuary airport(Maplin Sands) was looked at in the 1970s and rejected. Neither the weather nor the migration habits of the wild geese have changed in the interceding years. - A massive gas plant is located on Lord Foster´s site (the Isle of Grain)providing a high proportion of the UK´s gas needs, which would have to be relocated together with a power plant. - The flight paths for landings/take offs would infringe on Dutch air space which obviously they would object to, especially as the Estuary would be in competition with Schipol - the approaches are from the east-south-east and not north-east as stated in the article. - though four runways are envisaged are they not too close together for interference by airwake thus restricting usage of parallel runways? - Are all the costs included (such as movement of other facilities as mentioned)? There are many more questions which put into doubt such a project. This blogger has posted opinions before about the whole question of new runways in the South East of England and my opinions are well stated there about this folly. 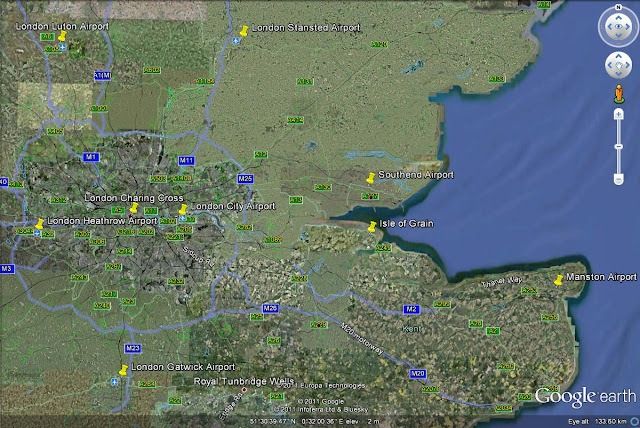 on 20 March 2010 "Runways in South East England"
on 5 July 2010 "Luton - The Next Best Bet ?" on 26 January 2011 "a new airport for London"
and 3 September 2011 "Half Way Hubs"
Other solutions do exist but need a little lateral thinking.